Elementary students celebrate the t-shirts they created with their learning partners from high school biology class. Falling leaves will soon blanket the Freeman Academy arboretum and lawns in Freeman. While some view to the colorful piles as chores, Freeman Academy staff see opportunities to help students gain knowledge and a heart to change the world through service. Last fall, while grades 1-6 studied creation care, freshmen and sophomore biology students were learning to identify trees in the arboretum behind their classrooms. Biology teacher Carol Stastny and elementary teacher Karla Rupp also saw a multi-age learning opportunity. 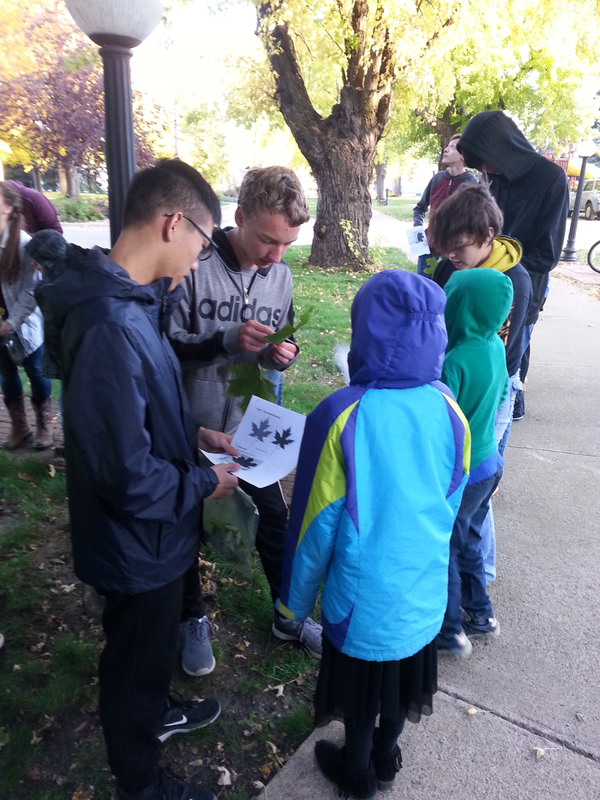 They paired up 1st-3rdstudents with 9th-10th graders for a leaf hunt. As the older students guided the younger, they reinforced their knowledge and gained experience mentoring. The younger students enjoyed the camaraderie while learning the characteristics of different species: blue spruce, bur oak, Norway maple, Ponderosa pine, and more. The next day, the teams reinforced their outdoor learning experience with a joint project. 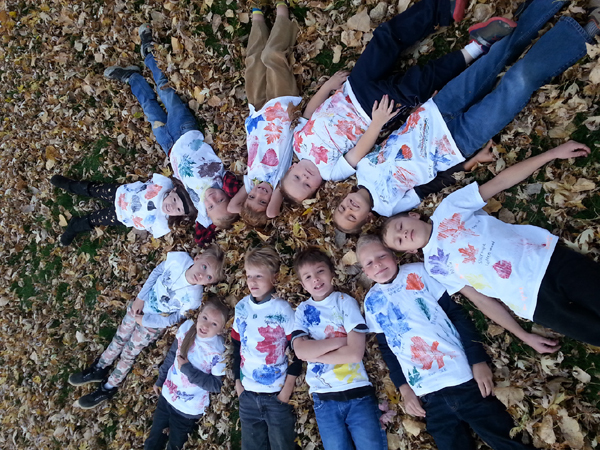 Students painted their leaves and, with a rolling pin, carefully transferred the images onto white t-shirts. FA’s youngest students enjoyed modeling their finished shirts during a chapel presentation on creation carethat they gave with grades 4-6. 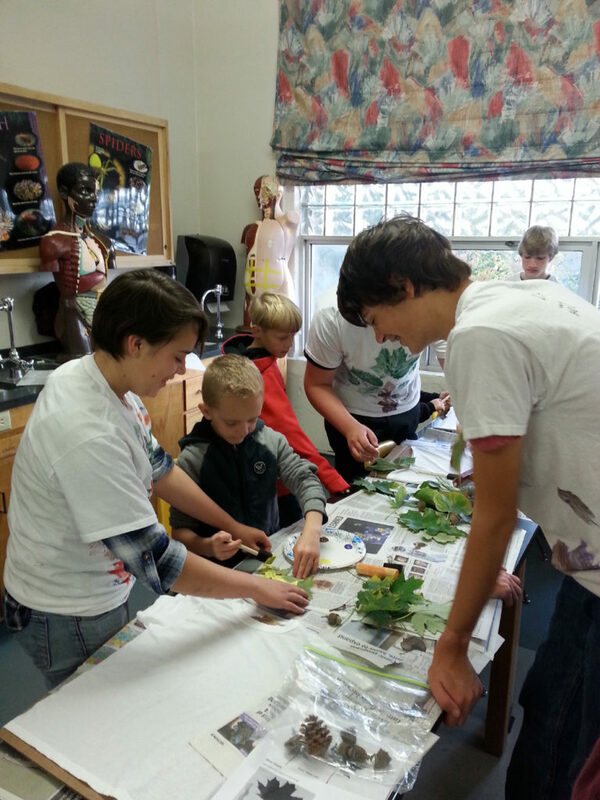 Leaves took center stage again, when students took part in community service day. Students in grades 4-12 assisted Freeman residents who needed help with raking or similar tasks. For students and teachers alike, the annual service day provides important opportunities to bond with each other and extend our school’s caring community to our closest neighbors. Our graduates point to these experiences as why they serve others in their adult faith. Changing the world one leaf and one heart at a time, that’s Freeman Academy: Faith-inspired Learning for Life.